I am getting tired of my Kindle. I feel like I’ve been reading the same book for two years. I never feel like I’m getting near the end. Actually, I’ve read about twenty books on my Kindle in the last two years, but they all blur into one endless monotonous book. Somehow, it seems like Andre Agassi has been searching for a murderer during the construction of the Panama Canal while constructing schools in Afghanistan despite the collapse of the global economy. I long for dog-eared pages, suntan lotion stained covers and indexes that I can quickly flip back and forth to. I long for the feeling of 900 hundred pages in my left hand and only 20 in my right. And the Kindle doesn’t look very good on my book shelf either. This entry was posted in Books, Humor, Ruminations and tagged Amazon Kindle, Books, Humor, Humour, Kindle, Musings. Bookmark the permalink. I really enjoyed your post and have had that same feeling with my Kindle. However, I still love my little Agatha (yep, named my Kindle) and like the lightness she provides when reading in bed or carrying her around in my purse! 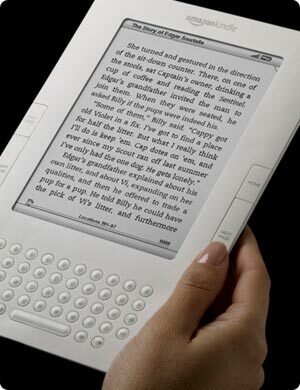 Stourton wrote about his year using an e-reader in the FT ( http://www.slate.com/articles/arts/ft/2011/10/the_kindle_fire_the_ipad_e_readers_what_happened_when_i_abandone.2.html ) and noted that if he likes a book he reads on Kindle, he feels he has to buy the the hardback which means he spends more money, rather than less, as a result of using e-readers! Do you have that problem? No, but I know there are some books I want to own in hardcover, particularly biographies and history books. Then when I actually want to read them, I buy the Kindle version to make it easier. So, I guess that’s the opposite with the same result. Found your post while searching through tags. I just can’t decide if I want a Kindle or not. I have a few other e-readers and sometimes I like them and sometimes I don’t. I agree with liking to know how far you are into a book by the feel and weight. 104 out of 425 just doesn’t have the same feel to it. I posted about the same topic a couple of days ago. You can always try alternating between e-books and physical books when you’re finished with a story. I do that to help keep myself from being bored with either one. Mine keeps breaking, which is not an endearing behavior. I keep getting tempted to make the plunge, but the paper and ink have kept me firmly grounded. The only thing that makes me curious is the whole, you don’t know when the end is coming (or do you?). In a regular book you know you’re getting down to the last few sheets, but in a ebook does it just end abruptly sometimes and catch you by surprise? Or does it count down? I guess some research could answer my question, but I’m essentially lazy. It counts down and tells you what percentage you have completed. This is why I have yet to get one, despite the convenience factor. Long-live paper books!